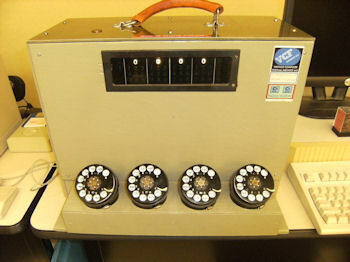 The Televideo PM/286 Computer with 8 user ports. The PM/286 is a near IBM AT clone with notable features such as a 286 processor with external switch to change from 8 mhz to 6 mhz (should you be feeling a bit slow that day) and cassette port for backup storage. 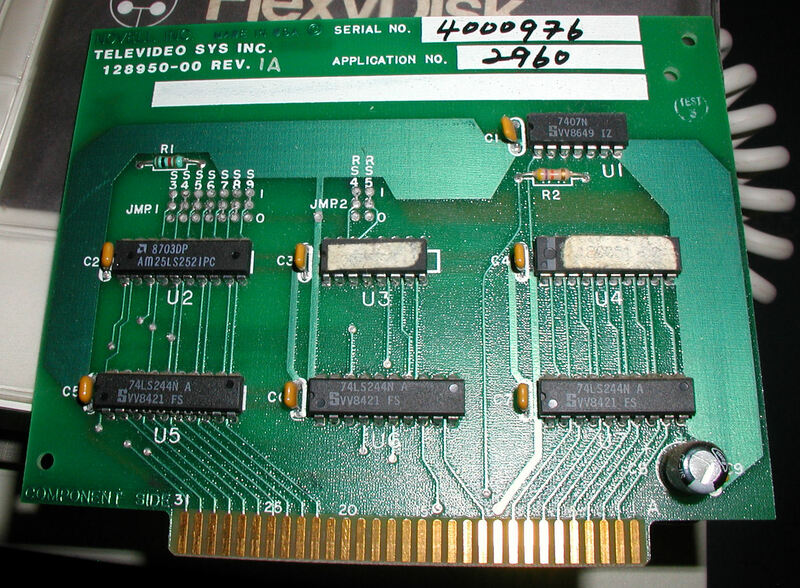 This model has a high resolution color CGA card, a Novell controller and a 8-port user controller. I have a complete batch of the system software, and I would like next to return this system to original condition. The manuals make it clear that this is an MS DOS based system. 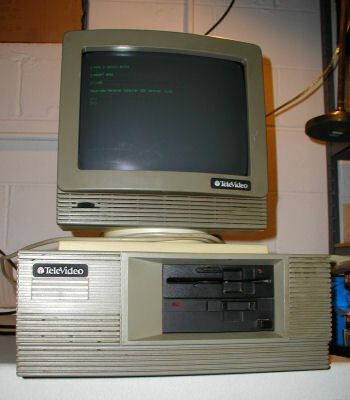 I put the computer in the same class as the early TI Professional "almost IBM compatibles". I wonder if it is possible to run CP/M or some variant, obviously with the 8 user ports this system is made to be a multi-user system and there may be a way to move files from older Televideo boxes using CP/M or MP/M to this machine. It may simply be that one should use the RS232 port for that. There is more to uncover here, but time is limited. This system has a bad battery and the motherboard was in pretty bad condition. I cleaned it up, and I found that I need to replace the battery. 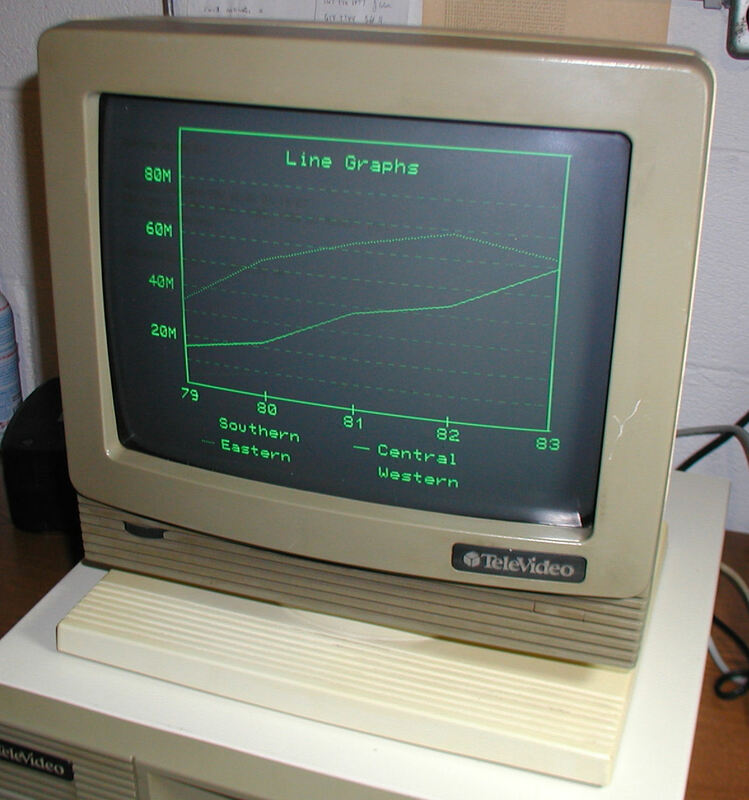 Here is an example of a 286 offshoot computer by Televideo that puts the 286 into historical perspective. Before IBM the standard product for small business computers was a CP/M - Z80 product with multi-user capability. Basically a large, heavy mini computer replacement with lots of terminal ports, plus various interface ports. Led by IBM, i8088 and later i80286 based systems began to crowd out the Z80 CP/M systems. The driver of this push was software. The 16-bit software was becoming more popular than the 8-bit CP/M driven stuff. Businesses especially did not change their preferences overnight, but the curtain was closing on the older systems. Companies like Tandy, Televideo, CompuPro, Texas Instruments, etc. were forced to adapt their product line to include systems that were compatible with Lotus 1-2-3 and MS DOS in order to stay competitive, so towards the end of their existence released i8088 and i80286 systems for business. The Televideo company is best known for it's terminals, and they did not get into the computer market until their 80x line, launched, yet a bit too near the IBM PC launch. We know who won. What's interesting and perhaps some of you find "vintage-worthy" is the way that some of these manufacturers built hybrid systems with clunky gadgetry to be included with their products. I suppose the idea was to offer features customers had come to love with XYZ company (we're still big and bulky!) plus the convenience of the i8088/286 processor. The Televideo PM/286 manual included a long list of IBM-platform software that was compatible. It looks like you have a clean example, you can still see the chips under the dust! These systems mainly ran Netware 2.0A. The Novell card contains the software licence and has to match the licence disk. The network interface is a Starboard which was an RS422 serial interface to either Televideo terminals or PC's with PM interfaces in. Each terminal had a node id which could be set with dip switches. To make this run again you will need televideo netware matching with the licence board. Fired up this Televideo PM/286 to find that the hard drive was suffering from "stiction", the slang term used to describe the condition where a hard drive's platters are not able to spin due to hardened lubricant grease. 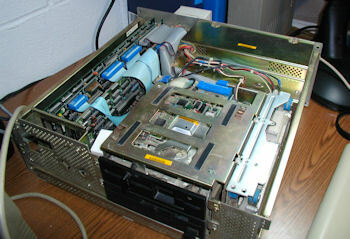 The hard drive can be seen to the right of the disk drive, positioned on its side. In order to get to the drive I had to remove a number of screws and stability braces. Being business systems, the PM/286 was meant to be be serviced by authorized Televideo techs. After a thorough cleaning, and hard drive de-stiction (open cover and rotate counter-clockwise a few turns), I was able to access the hard drive. As a test I installed the Televideo AT graphic demo to the hard drive (Televideo DOS 3.1). Next I need to replace the 7.2V Lithium Battery, but it's not vital. Until then I have to run the set up program each time after a cold-boot. By the way, PM/286 means "Personal Mini" 286. A suitable replacement of the TS-816? Can you please send me a link to the set up program? I can post on my youtube video about this machine and people will have a place to go when they ask, I can also put on my web site. I get a lot of inquiries every day, every little bit helps. I will archive my televideo disks for this machine asap, I have a lot of great stuff for it. It works for the most part but the PC will complain about incorrect date/time settings when it reboots. If you run gsetup again, don’t alter the date/time but just save and reboot these errors go away.